Well, hello February! January was a great month for the challenge -- we had 49 reviews added! I'm excited to see what you all will be reading this month. 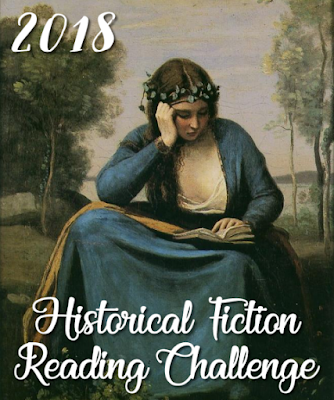 Welcome to the February link page for the 2018 Historical Fiction Reading Challenge. This is the page where you will enter the links to your reviews during the month of February 2018. I am finally able to make my way through the routes of both January + February - starting TODAY! I've been wanting to travel to your lovely blogs but due to health & life woes, I've been unable to til now. If you've stopped by my blog, I hope you've enjoyed the thoughts I've been sharing about the stories I've been reading. I look forward to engaging with you! Of late - I've found some quite magical reads to disappear inside including finishing the last two #SevenSistersSeries novels earlier in Feb: The Shadow Sister & The Pearl Sister - I am so hugged inside the series I am itching for the next in sequence but will remain humbly patient as I know how hard it is to write a series with this depth of continuity! More recently, I've been reading the #SamuelCraddock series but I didn't link them as I can't trace which 'era' their set inside!? They feel mid-century contemporary - but they could be only a few decades in the past, say the 80s? So, since I'm uncertain of that I've not added them but if you like dramatic crime stories with a keenly sharp lead, please visit those reviews - I've posted several and I have another one coming before March! Next, my joys as a reader were happily consumed by "The Forgotten Girl" based on the author's great-grandparents - so this is a very personal Biological Historical Fiction entry! Very emotionally stirring and heart-centred about how her relative not only had a dramatic immigration story to share but proves how hard-won courage and the faith to change your path in life can be to embrace. Lastly, I added my listening of an after canon story of Sherlock Holmes as to me, those are organically 'historical' - this writer truly impressed me for how he inserts us so readily into the canon of Sir Arthur and maintains the continuity therein! I am quite particular about these sequels... so for me this was a keen find! Only two others have convinced me of reading their stories: Laurie R. King (Mary Russell) & Nancy Spring (Enola Holmes). I just finished looking at all these reviews as well! I left it a bit late to get mine in. I read Mrs Shakespeare by Robert Nye. The last review I posted (A Fist Around the Heart) was published on March 2nd but I read it in February so posted here.